My esteemed colleague Donald Light, author/editor of the important volume, The Risks of Prescription Drugs (http://brodyhooked.blogspot.com/2010/08/how-many-new-drugs-are-lemons-ask.html) --to which I contributed a chapter--and I have just published a paper in American Journal of Public Health (subscription required). I immodestly believe that the concept in the paper is important enough to be worth laying out here in some detail. This blog has addressed the many drug flops from recent years, where a drug introduced with much fanfare later turns out to be either much less effective, or much more dangerous, than first thought. The poster child is probably Vioxx, where the drug was actually removed from the market, but the list is long. The question we set out to address--is this random bad luck? Or is something going on systemically that accounts for this phenomenon? The benefit-harm ratio of a drug should be dictated by the drug's properties, not how it is marketed. The drug industry's reputation is at stake: why wopuld they market drugs which are ineffective or unsafe? The FDA is supposed to protect us from ineffective or unsafe drugs. So how could the Inverse Benefit Law possibly be correct? Let's walk through the reasoning. 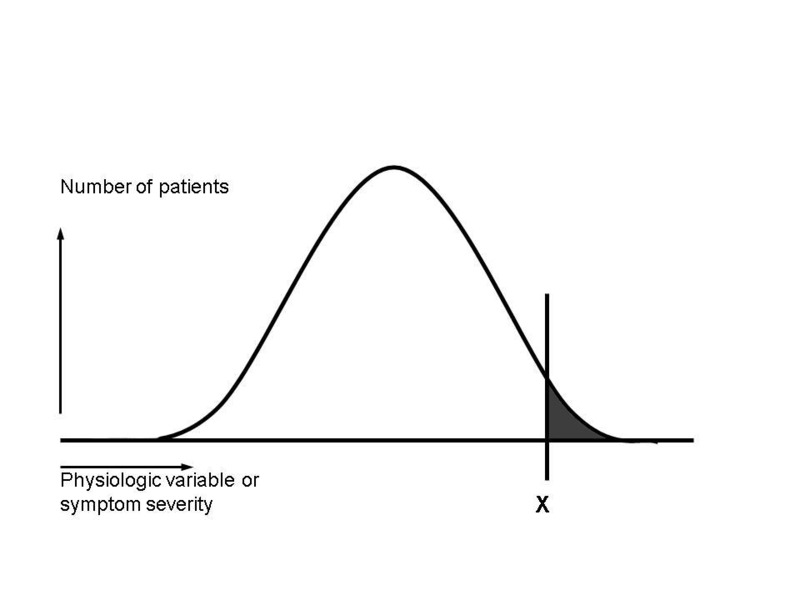 First, let's assume that the target condition for a drug exists within the population and is distributed according to the infamous bell-shaped curve. As you go to the right on the curve, the symptoms become more severe, or else the physiological variable that's supposed to be treated (such as blood sugar, cholesterol level, or blood pressure) becomes farther and farther above the mean for the population. 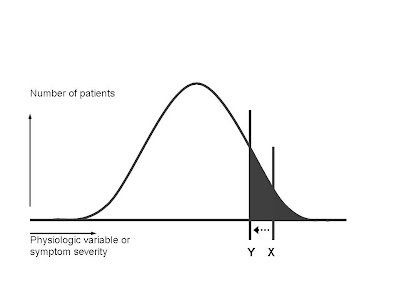 As a general rule, the patients who can most benefit from a drug are clustered at the right-hand portion of the bell curve--those with the most severe symptoms, or the highest blood pressure, etc. 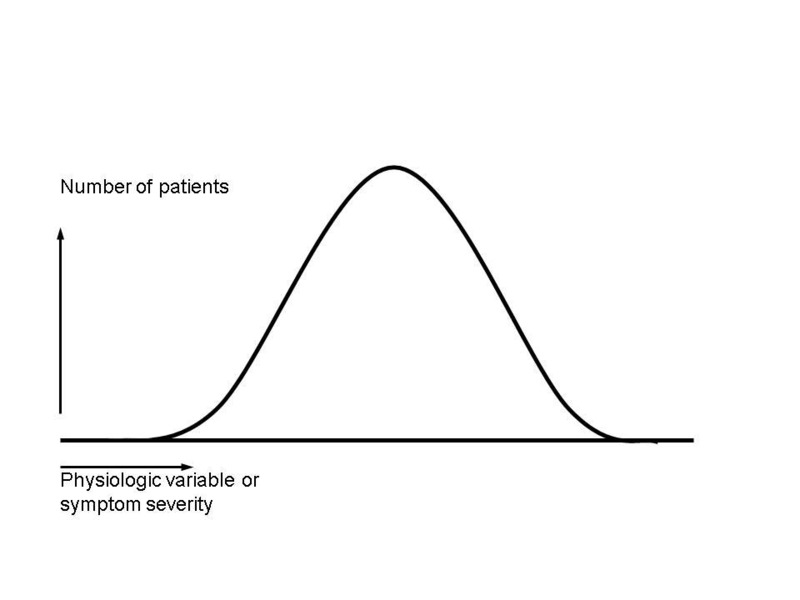 By contrast, all patients anywhere under the curve are equally at risk for any adverse reactions the drug may cause. 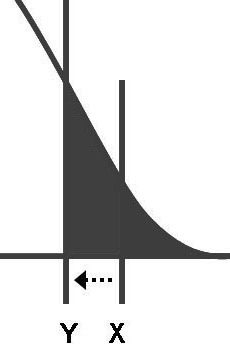 The line X demarcates an area under the curve (gray area) that represents the ideal benefit-harm ratio. The patients with the greatest need for the drug, who also have the greatest likelihood of benefiting from the drug, are supposed to receive it. (In statistical terms, this translates into a low number-needed-to-treat (NNT). NNT is like golf, low scores are better. It means that in order to get one patient to receive benefit, you have to treat a relatively small number of patients. The number of side effects is kept low, because a relatively small portion of the total population receives the drug. To the right of X, the benefit-harm ratio is quite favorable for the individual. They have a very good chance of receiving benefit, and that balances the real but small chance they might suffer an adverse reaction. The marketing folks at the drug company, however, have fits with drawing the line at X. It means that relatively few people in the entire population are "targets" for drug sales. Total revenues are very unlikely to reach the blockbuster status that shareholders demand. The shape of the bell curve shows us why the "left shift" is a marketer's dream. You have moved the threshold line perhaps very little. (Let's say for example you decide that instead of trying to reach a target blood pressure of 140, you decide to try to reduce the blood pressure below 130.) But, if you do a little measuring, you'll see that in this hypothetical example (not related to blood pressure), you have increased the gray area under the curve by a factor of at least 4. For marketing purposes this is great--you have 4 times as many folks out there to whom you can try to sell your drug (either by the reps marketing to their docs, or by direct-to-consumer ads). For purposes of improving the health of the population, it's a disaster. NNT goes way up-- you have to treat many more patients for a single one to benefit. 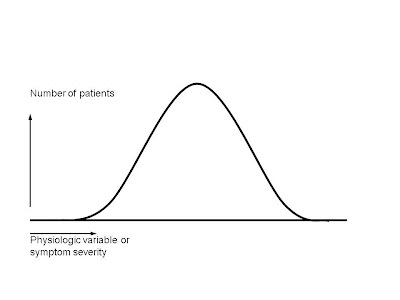 The number of patients sufferuing adverse reactions goes up by the same factor of 4. The ratio of benefit to harm turns very negative. So--how can the marketers make this left shift happen? We go into several mechanisms in the article, and give specific examples of which drugs have recently been marketed by each technique. None of these techniques will be strangers to regular readers of this blog. Briefly, we discuss: reducing the thresholds for diagnosing the disease (the magic cutoff for diabetes used to be blood sugar of 140, then 126, and finally 110, with the guidelines suggesting these changes often being written by docs with financial ties to drugmakers); using surrogate endpoints such as blood pressure, blood sugar, etc. to sell drugs that don't change the outcomes really important to patients like preventing stroke, heart attacks, and deaths; exaggerating benefits; minimizing adverse effects; creating new diseases like "social phobia" or making previous non-disease states into diseases (like osteopenia); and promoting off-label prescribing. We then run the drill about what needs to be done to halt each type of marketing ploy, and to remind docs that they are supposed to treat patients first and not become the tools of the industry's marketing mechanism. I believe our single most important line is: "Our claim, therefore, is not that the pharmaceutical industry sets out to market bad drugs. Rather, the scientific arm of the industry works hard to discover new drugs that are both effective and safe. The marketing arm then turns those good drugs into bad drugs, in effect, by extending their use beyond the proper evidence base." Brody H, Light DW. The inverse benefit law: how drug marketing undermines patient safety and public health. American Journal of Public Health doi:10.2105/AJPH.2010.199844, epub Jan. 13, 2011. Hart JT. The inverse care law. Lancet 1(7696):405-12, 1971. When it comes in marketing medicines, pharma company must be transparent on what do they medicine can do and be specific on every side effect that their medicines can cause. I'm not seeing the connection between marketing and moving around on the benefit curve. I agree that the "left shift" is a marketer's dream, but it's only a dream until the FDA allows a change in the label. It's their job to make sure such a change is warranted. I think too much blame is being placed on marketers here. Off-label marketing is already prohibited by the FDA, so that's covered. On-label marketing is perfectly fine, and it's the FDA who determines what's on the label in the first place. So they, not marketers, should shoulder any blame for the effects you've observed in your study. What Do We Really Know about Depression? 'Tis a French Custom--Libel Suits? What Do Pharma Execs Think? Nurse Practitioners: The Next Frontier?